It’s not the first time Trump tries to minimize the scope of his family separations at the border by claiming that President Barack Obama had the same policy. This claim and its variations have been roundly debunked. We gave them Four Pinocchios in June. But they’re back now, and so are we. Trump also claimed without evidence again that “criminals” are part of the migrant caravans traveling from Central America to the U.S.-Mexico border. The administration over the past month has tried to cobble together proof of Trump’s claim. It has almost nothing but supposition to show the public. Many of the caravan members are women and children fleeing violence in their home countries or seeking economic opportunity in the United States. They hardly fit Trump’s description of “very tough people” rushing the border. Obama had guidelines that prioritized the deportation of gang members, national security risks and felons. Once he took office, Trump issued an executive order rolling back much of that framework and scrapping the priority list. Trump’s January 2017 order refers only to “criminal offenses,” which is broad enough to encompass serious felonies and misdemeanors. But the key difference here is that in April, the Justice Department rolled out a “zero tolerance” policy of prosecuting all adults caught crossing the border illegally. As a result of this and the Department of Homeland Security’s decision in May to refer all illegal-crossing cases to federal prosecutors, families apprehended at the border were systematically separated. The reason is simple: Children can’t be prosecuted with their parents. This is worlds apart from the Obama- and Bush-era policy of separating children from adults at the border only in limited circumstances, such as when officials suspected human trafficking or another kind of danger to the child, or when false claims of parentage were made. When DHS presented family separations as one of several options to the Obama administration, it was immediately rejected as “immoral,” she added. Morality questions aside, the proposal would have been a costly “logistical nightmare” for DHS and the Department of Health and Human Services, which is tasked with resettling separated or unaccompanied children at the border, Muñoz said. 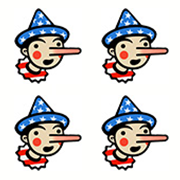 Responding to questions for a previous fact check, a DHS spokeswoman sent figures from fiscal 2010 through 2016 showing that, of 2,362,966 adults apprehended at the southern border, 492,970, or 21 percent, were referred for prosecution. These figures include all adults, not just those who crossed with minor children, so they’re not a measure of how many families were separated under Obama. For this fact check, we asked the White House whether it had a breakdown of these numbers that supports the Obama-Trump comparison on family separations. We didn’t get a response. No government agency or outside group appears to have data on family separations under Bush or Obama. The news program also reported on an uncensored DHS document it obtained: The “document reveals that child separation began nine months earlier than the administration acknowledged. There was a pilot program in the busy ‘El Paso sector’ from ‘July to November 2017.’ We don’t know how many children were taken in those five months.” But this is unrelated to Trump’s assertion that the Obama and Bush administrations separated families. As for Trump’s claim about “the flag waving Migrants, many of whom are stone cold criminals,” we’ve looked into it repeatedly (see here, here and here). The Trump administration has offered no proof of criminals traveling with the caravan. The most that can be said is that any crowd of 7,000 people is going to have some bad apples and that the Trump administration’s estimates of 270 to 470 criminals in the caravan comport with the ratio seen during a 2014 immigration surge. But it’s important to keep in mind that the Mexican government deports many criminals before they reach the United States and has named only two individuals in this case. Asked about U.S. Customs and Border Protection agents lobbing tear gas at children near the San Ysidro border crossing between San Diego and Tijuana over the weekend, Trump said it was necessary because they were being rushed by “very tough people.” He dismissed reports that children were among those subjected to tear gas. Photos and video taken on site show that these children were with their mothers, not hardened criminals. Men were also part of the group. "I felt that my face was burning, and my baby fainted. I ran for my life and that of my children,” Cindy Milla, a Honduran migrant with two children, told the Wall Street Journal. Time keeps passing by and the president is still shifting blame, refusing to acknowledge the scope of his family separations, defending them with falsehoods and peddling unsubstantiated claims about criminals in the migrant caravan. The administration has had ample time to find something, anything, to support these claims. But the tank remains empty, and Trump earns another Four Pinocchios.